Rusev will get his first ever WWE Championship match in July of this year. Rusev has been around the block, but has never really possessed that winning gimmick until late 2017/early 2018. Rusev Day has made a huge splash and it continues to be a fan favorite every week of WWE programming with chants abound on both RAW and Smackdown. I would even argue that although Rusev Day is rather over, Rusev himself may not be quite at the world championship level. Aiden English certainly helps the package, but Rusev as his own character is still a bit undefined for me. Rusev just recently broke out of the “evil foreigner” gimmick that continually plagues the WWE, and he has yet to show us what his character can really do. That is what I hope this feud will uncover in him. A world title feud with AJ Styles may be the point that Rusev can show us what he’s really got on the mic and how he handles himself in a high pressure, top of the card feud. I could be 100% wrong about the outcome, but I believe there is no chance that we see Rusev come out of this with the WWE Championship. I believe WWE has something else planned for SummerSlam, and that this feud is a placeholder for the month of July. I think that WWE is planning to have either AJ Styles vs. Daniel Bryan or AJ Styles vs. Samoa Joe for Smackdown’s SummerSlam main event. That’s why neither Bryan or Joe won the number one contenders gauntlet match on the June 19th episode of Smackdown. Bryan got diverted into a potential feud with The Bludgeon Brothers for some reason, and Samoa Joe could pick up another few credible wins before a WWE title shot. Once again, I’m not saying that the feuds for the next month will not be interesting, I just do not see them affecting anything that WWE is going to do in the next few months. Samoa Joe can pick up some more wins and Daniel Bryan can fight the Bludgeon Brothers, but it’s tough for me to see either of those ventures lasting longer than a month or so. SummerSlam will most likely feature AJ in the main event spot, either as the champion against some top star or the challenger on a rematch clause against Rusev. However, that does not mean that this current WWE title feud should be dismissed. As I said before, this is a big chance for Rusev to see if he can really break out and hang at a top level with the company’s bigger stars. Something I’d like to see for this rivalry is a lot of talking on Rusev’s part. 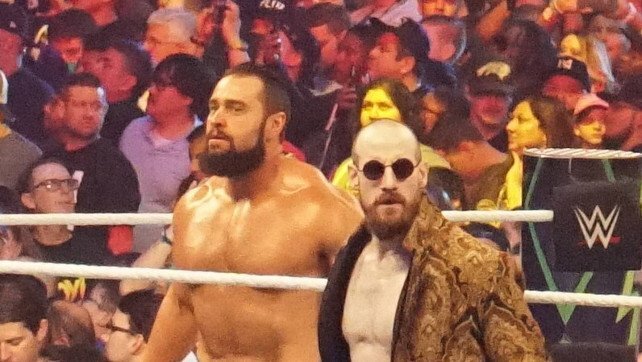 We all know that Aiden English is fairly accomplished in promos and songs, but Rusev should now start to show a little more of his own personality in the choices he makes. Will he be a heel? Will he be face? Will he have a problem with Aiden interfering in this feud? (He has already on Smackdown when he got knocked over by AJ). Personally, I believe Rusev, at this stage, would work best as a face and start to refuse heel tactics put forth by English during matches. That way, we can see into Rusev’s thought process and the way he wants to defeat AJ Styles clean. Unless WWE wants to turn him heel again, that may be the only way to have a great face vs face dynamic with some interesting elements (Aiden English and Lana) in the periphery telling Rusev to revert to his old ways. Rusev Day is great, but he will need more than that to have longevity. The month of July will be a big one in Rusev’s career, and I will be watching closely to see if he effectively capitalizes.